If there is any provider that is deserving to take one of the top five spots on the list of the best antivirus software in the market today, it is Trend Micro. Specializing in cloud-based Internet security and antivirus solutions, Trend Micro has been a reputed name in the software development industry for more than 25 years now. Founded in Los Angeles, California in 1988, Trend Micro now holds headquarters in Tokyo Japan, and continues to build on the legacy it has built its reputation on: great real-time antivirus protection, served to users in an interface that is highly intuitive and easy to use. 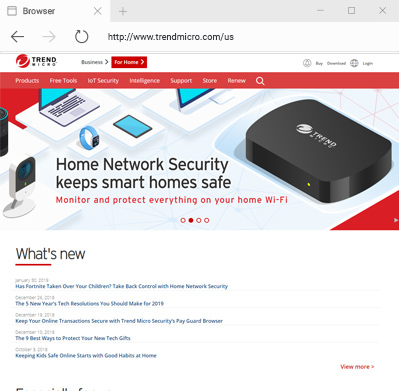 While Trend Micro boasts of a very powerful scheme, it still does not come without its disadvantages, which is why the Trend micro team never stops innovating and finding ways to make the program better for all its users – be they experts or beginner users. Trend Micro Antivirus+ (from $24.95/year). This package helps keep your computer virus free while checking your system for vulnerabilities and tuning up your computers. This package already includes licenses for three separate devices. Trend Micro Maximum Security (from $39.95/ year). Users can protect up to three of their devices with this package. This includes mobile device protection, privacy protection and cloud-based protection. This package also features system optimization and parental controls. Trend Micro Maximum Security PLUS Ultimate Service (from $69.95/ year). This package offers the highest protection, which includes all the features you can find in the first two packages plus premium installation, PC Tune-up, a personal IT help desk, security advisor and more. Prospective users will be happy to know that Trend Micro is fairly easy to install. During the installation process, the user will be introduced to the many features included in their chosen package. If there are new updates and definitions made for the program, they will also be automatically downloaded during the installation. After installation, the user will be shown the interface, which was designed to be highly intuitive - making it easy to understand and use. From a single glance, users will be able to figure out how the entire program works. The clean and no-fuss dashboard is very user friendly, so users can perform tasks with a few clicks. Therefore, performing a full scan or a quick scan and optimizing the system is hassle-free. According to a test performed by AV-Comparatives, the Trend Micro antivirus brand scored below average in terms of performance in traditionallydetecting viruses and threats. But even if that was the case, Trend Micro still came up on top in terms of real time scanning for infections. This shows that Trend Micro protects real-time as files are being saved. One thing users need to note is that the Trend Micro packages can cause the system to slow down a bit as they can take up the computer system’s resources. Compared to other antivirus programs, Trend Micro protection utilities require more space and PC capacity. Similar to other antivirus programs, Trend Micro offers various ways of support. On its website you will find tutorials, knowledgebase articles and an FAQ page you can refer to when you encounter issues with the software. For more urgent concerns that just could not wait, users are advised to call the Trend Micro support team. They can also send an email or start a chat with Trend Micro representatives. For higher-level concerns, there are also paid support options so you can get specific answers to your questions and customized solutions to issues. The only downside there is to Trend Micro is the average performance rates for traditional file scanning and threat detection; the rest of its performance is top-notch, so users will be getting great value for their money if they do decide to get this antivirus for their computer systems. Trend Micro antivirus also offers a 30-day money back guarantee, which communicates the company’s confidence in their products. If, for any reason, you are not satisfied with the protection Trend Micro offers, you can get a full refund as long as you ask for it during this period. Scan Preferences. This feature allows you to customize the way the software scans your files and downloads. It also helps get rid of unwanted applications and suspicious files and programs. Privacy Protection. The Trend Micro Maximum Security package features a privacy scanner which allows you to go through your web browsing untracked. It also has a data theft prevention feature that keeps spyware in check, ensuring that your data is protected while blocking infected websites, scanning mails for threats, and boosting your firewalls. PC Health Checkup. Even if Trend Micro takes up the computer’s resources, it does not really slow down the performance in a major way, thanks to the program’s performance optimization feature. This feature reduces computer startup time and fixes security vulnerabilities so you can regain disk space which would boost the system’s performance. If you want excellent virus protection, you can never go wrong with choosing Trend Micro to safeguard your computer system. The program’s real-time protection plus added security, wonderfully easy to use interface, computer system optimization tools and other special features make up for the below average performance for traditional file detection rates. Trend Micro is a great choice for users who want online cloud-based protection, family protection controls and system optimization at an affordable and reasonable price.